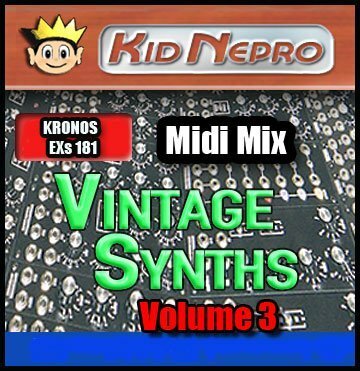 Kid Nepro’s Electric Piano sound collection for Kronos contains a great mix of Mod-7 and EP1 programs. A wide assortment of your favorite Electric Pianos. NOW ONLY $25. USD. 32 EP programs included. The first sixteen programs use the Mod-7 engine and emulate the classic DX7 electric piano sound that was used on countless recordings during the 80’s and 90’s. The next eight programs use the EP-1 engine to create a more traditional Rhodes or Wurlitzer Electric Piano sound. The last eight creates something new for Kronos by combining both engines, with EP-1 using the first EXi and Mod-7 using the second EXi. We relied heavily on the effects to boost the sound and give the programs more bite, which will help you cut through your live mix or studio session. Kronos E-Pianos is perfect for your next studio recording or live gig. Or if you just want to jam along, the cool KARMA grooves included on all 32 Programs will have you jamming for hours. 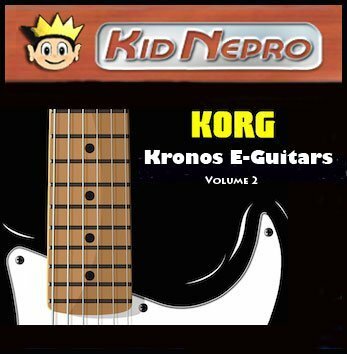 Kid Nepro has just released Volume 12 for the Korg Kronos Series. Sounds are compatible with the original Kronos, Kronos X and Kronos 2 workstations. 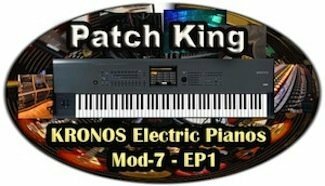 The Patch King has now made available an amazing collection of sounds from our custom sample libraries for the Kronos HD-1 sound engine. Midi Mix includes only the finest mix of analog and digital synth sounds all set up and ready to load into your Kronos. Something wonderful happens when you combine the warmth of a vintage analog synth to the clean digital sound and multi effects of a modern workstation. Midi Mix contains samples from over twenty of the best synthesizers released over the past three decades. All sounds are sampled from Kid Nepro’s custom made sound libraries and then layered together to create totally unique textures and super fat sounds! Good news! 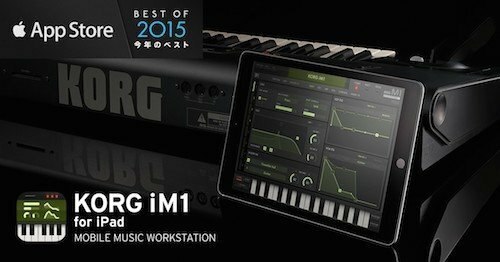 All Kid Nepro sound libraries for the Korg M1 are now compatible with the new iM1 app for the Apple iPad. We’ve been getting lot’s of e-mail from iM1 owners who would like to know exactly how you import our sounds into the app – so we have put together a step by step on how it’s done. Just contact us if you need more info. Our customer support rules! 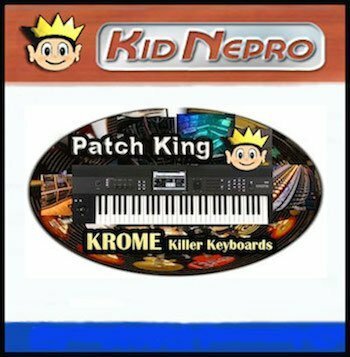 Kid Nepro has just released our fifth sound library for the Korg Krome workstations. Killer Keyboards – is packed with a great mix of new keyboard sounds perfect for your live gig or studio session. Krome Killer Keyboards contains 64 New Programs. From our experience as programmers and keyboard players, we know one thing for sure – Keyboard Players always want more Keyboard sounds. The first thing we check out when we buy a new synth is the keyboard sounds. We are always searching for the perfect Rhodes, Wurli and Acoustic Piano patch. We get calls and e-mail from keyboard players all over the world who feel the same. So a few years ago Kid Nepro started producing complete soundbanks based on nothing but keyboard sounds. We call them “Killer Keyboards”. Kid Nepro has produced several other Keyboard soundbanks for instruments like the Roland JV80 & JV1000, Korg M3, 01W, X3, Triton and Trinity Series. So you know we have lot’s of experience programming killer keyboard sounds. 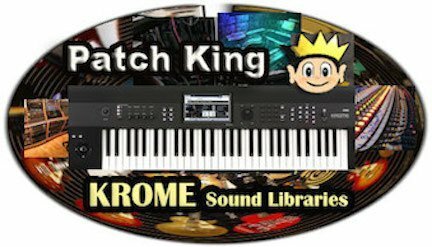 Krome Killer Keyboards creates a powerful new sound library for musicians and has everything that will easily get you through your next live gig or recording session. There are several new Grand, Rhodes and Wurli Pianos, along with a great selection of B3 and Pipe Organs, Funky Clavinets and Harpichords. We’ve also layered several keyboard sounds with Strings, Pads and Choirs to provide everything you need in one easy to load sound bank. All programs contain great mix of ARPS & Drum Patterns that you can jam along with. 64 Programs / 16 Combis / 16 MB New Multi Samples $49. USD. 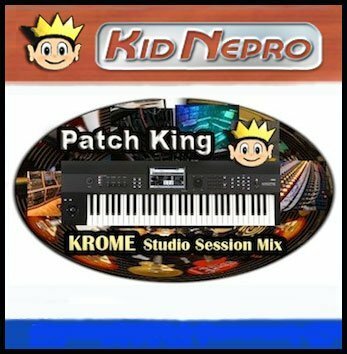 Korg Krome Volume #4 – Studio Session Mix – Kid Nepro’s 4th release for Krome is now available. A great mix of new programs & combis perfect for your live gig or studio session. Krome Studio Session Mix contains 64 Programs & 16 Combis and 16 MEGS of new samples. Krome Studio Session mix creates a powerful new sound library for musicians doing “live gigs” or “studio sessions”. All sounds are programmed towards the type of sounds that you would use on a gig or a recording session. There are several new acoustic and electric pianos, strings, pads & choirs, guitars, basses and leads and a nice mix of ARPS & Drum Patterns that you can jam along with. All sounds were programmed with the modern controls from the latest Korg workstation to bring you everything you need on your gig or session. All programs and combis include ARP and Drum Track functions as well as control assignments to the Krome Joystick, SW1 & SW2 and User Knobs 1-4. The result is the best sound with the best modern controls that will inspire you to create amazing new music. Krome Studio Session Mix is perfect for your next studio project or live performance. Or if you just want to jam along, the cool ARP’s and beats included on all Programs will have you jamming for hours! You need a SD Card & Smart Media adapter. Also known as a “card reader”. Make sure that you get a card reader that has the SD option. Some card readers will have up to eight different card options. So just make sure that your SD card and reader will work together. 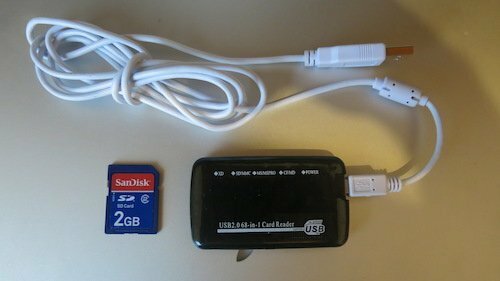 SD cards and card readers can be found at many places that sell computer accessories for a few dollars. Connect the smart media adapter to the USB port on your computer. 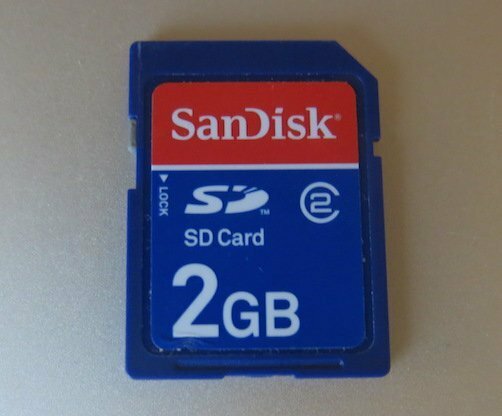 Then insert the SD card to the Smart Media adapter and the card will appear on your computers desktop. Unzip the file you downloaded and save everything to the SD card. Then take the card out of the adapter and insert into your Krome and load from the “media” section. Follow the details in the loading instructions that we included with your download. It’s quick & simple and the price of the adapter and the SD card are about what you would pay for shipping via snail mail. Note that files our delivery via download only. Pick the “email delivery” option at our online order form. If you need any more info just e-mail us. Our customer support rules. 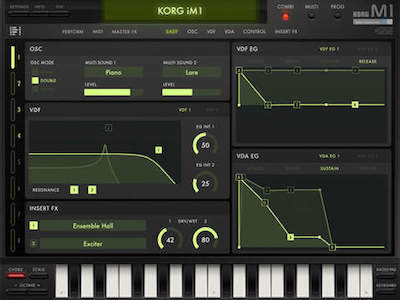 More info on all our Korg Krome sounds can be found OVER HERE. Korg Krome Volume #2 – Electric Guitars – Kid Nepro’s second release for Krome is now available! A great mix of new programs, combis and samples, perfect for producers and keyboard players looking to add some hot guitar sounds to their Krome workstation. Electric Guitars contains 16 Programs, 8 Combis and 32 MB of new sample data. The new sound library includes a wide assortment of the best Electric Guitar samples from our friends at Big Ball Music. Everything from our 1957 Vintage Guitar to our brand new custom Electric AX, these new sounds will have you jamming all night. Sounds include clean guitars and harmonics for that light rock or funk track, or full blown distorted or overdrive power leads and feedback that are perfect for rock or metal tracks. All sounds were programmed with the modern controls from the latest Korg workstation to bring you an amazing collection of electric guitars. All programs and combis include ARP and Drum Track functions as well as control assignments to the Krome Joystick, SW1 & SW2 and User Knobs 1-4. The result is the best guitar sound with the best modern controls that will inspire you to create amazing new music. Krome Electric Guitars is perfect for your next studio project or live performance. Or if you just want to jam along, the cool ARP’s and beats included on all Programs & Combis will have you jamming for hours.